Ready to get engaged? Celebrate your love and commitment with a ring that is just as dazzling as your future together. Whether you gravitate towards the simplicity of a solitaire, a blinged-out double halo or brightly-colored stones, we've curated the sparkliest new options for every bride-to-be. 10k white gold engagement ring by Hallmark Bridal at JCPenney. Caress ring in pink gold by De Beers. Pavé leaf diamond engagement ring in platinum by Monique Lhuillier at Blue Nile. The Center of My Universe (TM) split shank oval ring set in platinum by Forevermark by Premier Gem. Solitaire diamond-embellished prong engagement ring by Ritani. Cushion-cut diamond in an ornate diamond and platinum setting by Neil Lane. Emerald-cut diamond ring by Tacori featuring graduated round diamonds and tapered rows of pave-set diamonds. 18k two-tone gold engagement ring by Yael Designs Luna Collection featuring a natural pink diamond, accented with pink and white brilliant-cut diamonds. Wisteria engagement ring in platinum by David Yurman. Floral halo diamond ring with split shank in 18k white gold by Parade Design. Signature beaded solitaire engagement ring by Hearts on Fire. Ruby and diamond cushion halo ring in 18kt yellow gold by Ritani. Engagement ring by Verragio's new Classic Collection featuring princess-cut sapphires and round brilliant-cut diamonds to enhance a princess-cut center. Hazeline ceremonial ring set by Anna Sheffield. Rose gold engagement ring by Simon G. set with round brilliant-cut diamonds. Oval diamond ring set in platinum with channel-set band by Kwiat. Destiny twist engagement ring with diamond band by Hearts on Fire. Platinum engagement ring by Yael Designs Contempo Collection featuring brilliant-cut diamonds. Radiant cut diamond ring in platinum by Kwiat. Euphoria custom halo engagement ring by Hearts on Fire. Classic round-cut diamond in a diamond and platinum setting by Neil Lane. 18kt white gold ring with blue sapphire and trapezoid diamonds by Yael Designs Contempo Collection. Diamond and platinum heart locket ring by Neil Lane. 18kt white gold ring by Yael Designs Luna Collection featuring a fancy yellow diamond. Bea ceremonial ring set by Anna Sheffield. Ring with round diamond center and round brilliant-cut diamond accents by Verragio's new Classic Collection. Marquise diamond Past Present Future® engagement ring in 14k white gold by Zales. Princess-cut diamond engagement ring by Simon G. accentuated with round-cut diamonds in an eye-catching openwork design. Yellow gold engagement ring by Tacori with round center diamond and cushion-cut halo. Emerald-cut diamond and platinum ring by Kwiat featuring two trapezoids. Attelage marquis diamond ceremonial set by Anna Sheffield. Oval diamond and platinum ring by Kwiat featuring two half moons and a diamond frame. 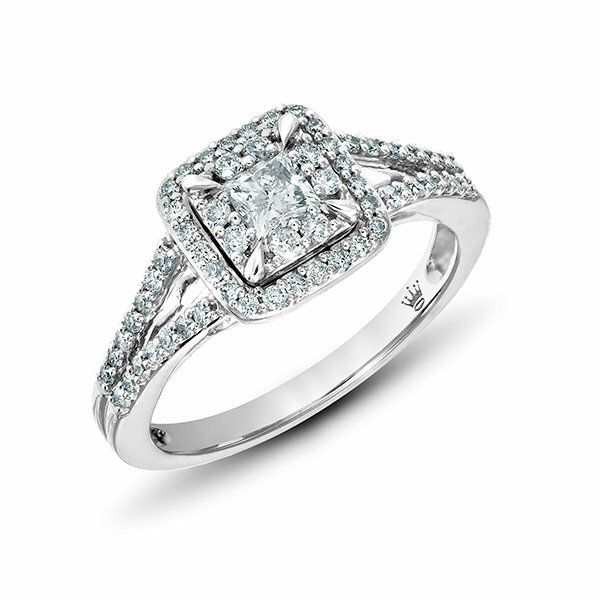 Celebration Grand® princess-cut diamond three stone ring in 14k white gold by Zales. Round-cut diamond ring by Tacori featuring bezel-set brilliant round diamonds enveloped in circular and rectangular yellow gold baskets. Milgrain marquise and dot diamond engagement ring in 14k white gold by Blue Nile. Emerald-cut diamond and platinum architectural ring by Neil Lane. Oval-shaped diamond ring by Tacori featuring brilliant round-cut diamonds scattered with unique marquis-shaped designs. Round brilliant-cut diamond ring in platinum by Kwiat. Three-stone diamond and emerald-cut sapphire halo ring by Ritani. 18k white gold engagement ring by Yael Designs Contempo Collection featuring an emerald-cut diamond. Modern bypass micropavé diamond band engagement ring by Ritani. The Center of My Universe (TM) three stone ring set in 18k white gold by Forevermark by Rahaminov. The Center of My Universe™ pear-cut diamond ring set in 18k white gold by Forevermark by Rahaminov. Floating halo diamond engagement ring in 14k white and rose gold by Blue Nile. Oval-shaped diamond in a diamond and platinum halo setting by Neil Lane. Ideal cushion-cut diamond double band ring set in 18k white gold by Forevermark by Natalie K.
Solitaire emerald-cut diamond ring set in 18k white gold by Forevermark by Jade Trau. 14kt white gold bridal set by Neil Lane at Jared. Engagement ring by Simon G. featuring round-cut diamonds highlighted by tapered baguette-cut side diamonds. 14k white gold vintage engagement ring by Sylvie Collection featuring a cushion-cut center diamond. Round-cut diamond engagement ring by Tacori featuring a dainty modern halo. Oval diamond engagement ring by Verragio's Couture Collection, featuring a rose gold profile and round brilliant-cut diamonds. Vintage collection diamond ring in platinum by Kwiat. Princess-cut halo diamond engagement ring in platinum by Blue Nile. Pear-shaped diamond double frame engagement ring in 14k white gold by Vera Wang LOVE at Zales. Hand-engraved ring by Leo Ingwer featuring an antique reproduction shank and diamonds on head profile. Handmade ring by Leo Ingwer flanked by six cascading emerald-cut diamonds set with a touch of milgrain. Handmade modern engagement ring by Leo Ingwer with bezel-set side stones. French-set halo diamond "V" band engagement ring in platinum by Ritani. 14k white gold classic engagement ring by Sylvie Collection. 14K white gold engagement ring by Sylvie Collection with a milgrain shank and double halo around the center. Engagement ring by Verragio's Couture Collection featuring a round diamond center, round brilliant-cut diamonds and a rose gold profile. 14kt white gold milgrained oval-shaped engagement ring by Leo Ingwer featuring pear-shaped diamonds and a round diamond melee. Art Deco halo engagement ring in platinum by Monique Lhuillier at Blue Nile. 14k modern criss-cross solitaire engagement ring by Sylvie Collection. Pavé diamond cluster ring in 18kt rose gold by Ritani. Handmade antique-inspired engagement ring by Leo Ingwer featuring a bezel-set stone and miligrained halo. Renaissance engagement ring in platinum by David Yurman. Sculptural halo diamond ring set in 18k gold by Parade Designs. French pavé diamond engagement ring in 14k rose gold by Blue Nile. Princess-cut quad diamond bridal set in 14k white gold by Zales. Marquise and round diamond engagement ring by Parade Design in 18k white gold with 18k rose gold details. Channel-set baguette trio diamond engagement ring in platinum and 18k yellow gold by Truly Zac Posen at Blue Nile.